23 Steps to the Beach. 23 steps walk to a private sandy beach. No roads to cross. The Main House at Sea Shells cottages in Wellfleet is a full-sized home, roomy for large families or groups. Our beautiful beach is adjacent to the Cape Cod National Seashore. Great beach for swimming, kayaking, sailing, exploring, reading, writing, collecting sea shells and relaxing. Gentle waves, no riptides to worry about, tidal , naturally clean, wonderful for small children. Please note that occupancy is limited to 11 people during the summer, 13 allowed off-season. 5 ocean Kayaks are included in the rental. Enjoy full water views from our south-facing, 2,000 square foot, Cape Cod-style, two-level no basement home. Lots of windows, sliders, and decks. Our kitchen has ample counter space, full sized appliances and a water view. LOCATION. The 'Sea Shells' cottages, Chequessett Neck, Wellfleet, Cape Cod. The Sea Shells is a cluster of 'Olde Cape Cod' style cottages in a secluded, private beachfront location. Walking distance to Wellfleet's seaside golf course. 1 mile to the historic village of Wellfleet - restaurants, shops, fresh local seafood, organic produce, and art galleries. Walk down the beach to Wellfleet Pier. At the Pier - go on a fishing excursion, rent a sailboat, order cooked lobsters for dinner at Mac's, go to a show at Wellfleet Harbor Actor's Theater (W.H.A.T.). Walk to a tot park playground with tennis courts, basketball, a frisbee field, swings, and a skate board park. Wednesday night there's square dancing at the Pier. From the Main House, walk to the LEFT down the beach to the Pier in about 20 minutes. At the Pier there's burgers, fried clams & ice cream at the walk-up window. Sit at picnic tables along Mayo beach. There's 3 restaurants there to choose from. From Main House walk down the beach to the RIGHT and you'll pass secluded beaches, reach the Cape Cod National Seashore, and experience peace and beauty. SIZE. The Main House is NOT a cottage with small, adjacent bedrooms, thin walls, and pioneer quality beds. Our family vacation home is spacious for 1 family, can comfortably accommodate an extended family, 2 families, or groups of friends with privacy. Excellent for family reunions and work retreats. SLEEPING. 5 bedrooms + 1 family room with futon convertibles and a door for privacy for use as a 6th sleeping room. Two full bathrooms. LIVING AREAS. 1st floor Family Room has a TV, DVD, refrigerator, 3 sofas, a games table and laundry. The 2nd floor Living Room has a flat screen HD TV with Blue Ray DVD player, Netflix, and view of the water. The Dining room table seats 8, can squeeze 12, + 4 people can sit at the kitchen island. All with water views. Relax and dine on the front deck with the sound of the waves. Play Ping Pong in the sandy area in back. There's a table, chairs, a rocking chair, beach items and toys. Wonderful place for kids. CHILDREN. 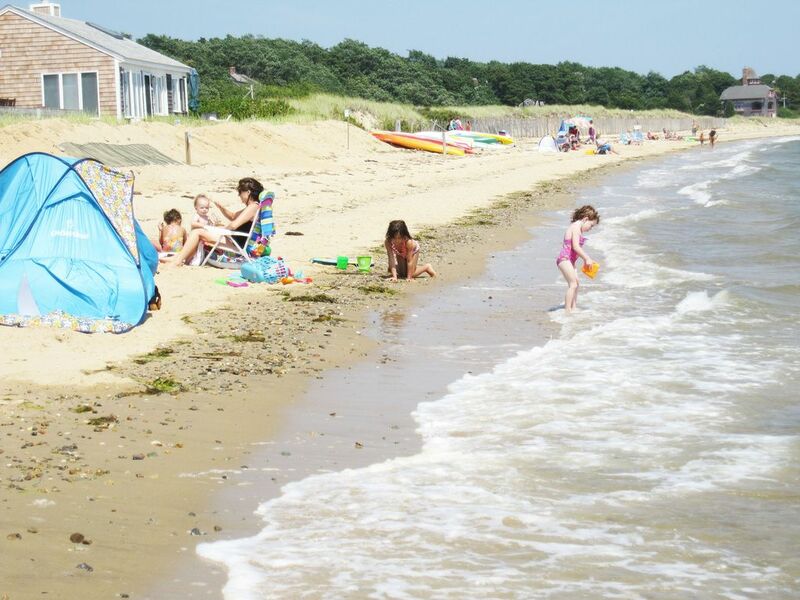 Wellfleet - the BEST place for young children on Cape Cod. OUR BEACH. Our bay beach has gentle waves, no riptides. Drive, walk, swim, or kayak to Great Island - a protected ecological treasure - part of the Cape Cod National Seashore. Remodeled 2nd floor bathroom with enlarged shower. Mahogany hardwood decking on our 40 foot front deck overlooking the water. 2 SUP board hybrid kayaks. 5 ocean kayaks are included - explore! 2 one-person hybrid SUP board kayaks. All are easy to use sit-on-tops -easy for ALL ages - including YOU grandma! 7 people total can paddle to Great Island in about 20 minutes. Great Island is part of the Cape Cod National Seashore. Beach your kayak and walk along miles of secluded beach. Welcome to Cape Cod National Seashore. Explore, listen to the sea gulls, the waves, relax... this moment perfect. There's a walking trail upland - follow the signs to the old tavern site - from the 1700s. Adventurous? Continue kayaking along the edge of Great Island and try to reach Jeremy Point. Lotion up! It's submerged except at low tide. Return to Main with the wind and waves at your back. Enjoy a cold beverage and relay your tale of high sea adventure with enthusiasm and embellishment. Collect shells, pretty stones, at night - watch the moonlight on the water, breath in the salty air, listen to the waves. Sleep will be restful. BOOKING: Summer is Saturday to Saturday by the week only. Flexible start and end dates are possible in Spring and Fall. Stays of less than a week are possible in Spring and Fall. For more information and pics find my site. Main House. Sea Shells cottages. Wellfleet Cape Cod. Keywords: Family Vacation Home. Big Beach House, Beachfront getaway, kayaks included, SUP board, kayaking in Cape Cod National Seashore, beautiful, peaceful, great swimming, boating, sport fishing, sailing, waterfront, "the Gut", beachfront, kayak to Great Island, collect sea shells, Cape Cod, Wellfleet, Outer Cape, explore.. This property is our family vacation home, and the regular vacation home for various repeat guests, some of whom have been coming to Wellfleet for over 50 years! Sometimes there are 4 generations vacationing at Main - I love that. My wife & I have been coming to Wellfleet since the 1980's. Recently, 4 dear friends and 2 family members have bought property here - so nice for us. My wife's a psychologist and I'm a real estate broker. My company is Franklin Real Estate in Lexington MA. If you want to talk about Buying vacation rental property, get my 2 cents worth of advice - feel free to give me a ring. Adjacent to Cape Cod National Seashore. The beauty. The quiet. The salty air. The sand between your toes. The swimming at high tide. Walking around at low tide -different every day. The soothing sound of the waves. Explore Cape Cod National Seashore by foot or by kayak. Sand dunes, salt marshes, & secluded beaches. Especially peaceful in the off-season. Water is warm enough to swim in. This is living! Wellfleet has a uniquely quaint Center with the look and feel of an old fishing village, with numerous small art galleries. It's about 30 steps to our private sandy beach. Warm water, gentle waves, no riptides. Ocean views from the kitchen, dining and living area, and from our 40 foot deck. Full view of the water from inside of Main. It's about 30 steps to our private sandy beach. Warm water, gentle waves, no riptides to worry about. Up to 3 cars. Firm Rule. HDTV and a view of the water. Additional frig in the downstairs family room. Glass top oven, convection oven, and toaster oven. No Kuerig. Electric coffee maker. Drip filters with a 2 liter carafe thermos. Small electric coffee maker. Coffee bean grinder. Plenty of bowls and pans. Full-sized appliances, wine glasses, spices, lobster/clam pot, coffee bean grinder, coffee maker, blender, mixer, toaster, large island work space, ample counters, salad spinner, microwave, cherry cabinets, natural light, water view, outdoor dining. Hardwood dining table seats 8 comfortably . Can squeeze up to 12. 4 people can be seated at the island. All will have a nice view of the water. 40' HD TV in the Living room. Also a 2nd TV in the 1st floor family room. Board games, puzzles, a few toys. Board games for adults and kids. A handful of our favorite movies on DVD. Included: 2 Two-person sit-on-top ocean kayaks + 1 one-person sit-on-top + 2 one-person Hybrid SUP board / kayaks Surfboards available for rent at Jack's in Wellfleet. Rentals, fishing excursions at Wellfleet Pier are walking distance. Rear deck for sitting, outdoor games, shade, a rocking chair & ping-pong. Public courts walking distance. Private Clay courts nearby - 1 mile. Less than a mile at the Chequessett Neck Yacht & Country Club. Private, open to the public. Google for more info. That’s what we wanted and that’s what we got . We’ll be back! Highly recommend if you like water sports in a beautiful , uncrowded setting. Thank you for your review Alfie. Hope you all do come back next year. Repeat guests get a small discount on the Main House weekly rate. “Big beach house with kayaks.” That’s what we wanted and that’s what we got. We’ll be back! Highly recommend if you like water sports in a beautiful uncrowded setting. So much fun in one week! Thats what we wanted and that’s what we got. Wellfleet is such a great location for beginner OR advanced kayakers. And the 5 sit-on-tops included - they can’t sink and you could hardly flip them over if you tried. We also enjoyed going on a 1/2 day fishing excursion with the Naviator out of Wellfleet Pier. We all caught fish. For a tip they cleaned and filleted them, and we ate our catch for dinner! The house itself is straightforward and as described on Vrbo. One of the 5 bedrooms is a “walk- thru” bedroom. One is very small. There were no ant problems which we’ve found to be the case at other Cape Cod rentals. The owners seem ‘hands on’ in taking care of the property. Having 2 big living rooms on separate floors with TVs was nice. So was the ping pong. We could’ve really used 2 weeks. I recommend the Main House and Wellfleet in general if you like active and outdoorsy vacations. Main House, Sea Shells cottages, Wellfleet. Everyone that we wanted was here. We're an extended family - 4 years old to 88! The property is presented accurately, though the owner has an individual site with lots more pictures. He is easy to reach and we did have one minor issue which was fixed within hours. Wellfleet is pretty far out Cape Cod, 100 miles from Boston. But the beaches and restaurants are terrific and less crowded. For restaurants we liked Winslows and the Wicked Oyster. At the house we liked having ping-pong. A 2nd frig was handy. We would definitely recommend and come back if our family's schedule allows. We’re ages 3 to 65 and there’s fun and relaxing activities for all of us. The Sea Shells beach is top notch , really peaceful, and perfect for the kids. We love the kayaks, the ping pong in back, Great Island, Wellfleet oysters and local fresh fish... Everything about the house is as advertised. And nice and quiet at night. Thanks Howie. Wellfleet’s the best! Big 2nd floor living area including kitchen, living room, and deck--by far the best quality of the house. The space behind the house has ping pong and sand for kids to play in. Kayaks were fun to take out. A few of us made it to the great island once. Wellfleet is a nice Cape town with lots of food options if you don't want to cook in. Not a sandy beach. The private beach is covered in rocks, and the tide goes out 1/4 mile leaving mud flats behind, so the kids could only swim during high tide.You have to have water shoes. Plus you can't really see the beach from the house, but you can see the water over the tops of the beachside cottages. Not a good house/area for little kids. The houses are extremely close together and the owner contacted us that people complained that they could hear the baby crying and toddlers when they were outside playing in the sand. Huh? That's what babies/kids do! It's an old house and needs lots of updating. We had issues with the dryer which burned clothes, and one of the two showers was broken a few days. The owner did offer to compensate a nominal amount. The couches smelled very musty and "used". Awkward room layouts. The "6th sleeping room" is not exactly private even with the door closed, because one of the other rooms is attached making it another pass through situation like the bedrooms upstairs. So really one private BR, one with bunk beds, and the others are pass throughs. It's true the dryer malfunctioned and I'm inclined to believe that it damaged their clothes. I offered a $300 refund. The guest asked me for a refund of $2,000! Indeed the bedrooms do not have water views. As pictured on VRBO, the water views are from the deck, the kitchen, the living room, and the dining area. VRBO no longer allows a link to my individual Main House Sea Shells cottages site, where you could see hundreds more pictures of the interior, the views, the beach, and beautiful places that are walking distance. Shoulder-season, my guests are sometimes groups with no children, but in the summer when I'm not at Main with my family, guests are almost exclusively families with young children. Most kids LOVE it when it's low tide and they're free to roam and explore! Often my wife and I arrive to find their sea shell collections neatly arranged on the front porch. Swimming is certainly NOT confined to just at high tide. As to the this guests criticism of the bedrooms.. There are 5 bedrooms. Indeed one has bunk beds (another thing kids seem to like). It's simply not true that all but one are 'walk-thrus.' There is only one bedroom that's a walk-thru bedroom. The rest are 4 legitimate private bedrooms, (Though one is very small) and none share a wall with each other, which maximizes privacy. Bike riding on the Wellfleet Rail Trail. Square dancing at Wellfleet Pier. Pilgrim Monument, Museums & Sightseeing in Provincetown, Wellfleet's thriving Art Galleries. Swim in Wellfleet's pristine kettle ponds. Let the Naviator take you out for a morning of fishing. Sailing in front of the Main house. Ping-pong in back of the Main house. Best Canoeing & Kayaking on Cape Cod. Kayak across to Great Island & the National Seashore. Do nothing, listen to the waves. The payment amounts, payment due dates, cancellation policy, what is included and not included, house rules and more, are detailed in the rental agreement. INQUIRE for a rental agreement to look over. Rental agreements can be emailed and are subject to your review BEFORE sending a deposit. INQUIRE for a rental agreement to be emailed to you. WEEKLY rates are as posted. Discounts for 6 or less guests. Discounts for returning guests. Payment Options: PayPal, Personal Check (preferred), Homeaway Book online. For Homeaway Book online they charge a fee.